I haven't been on a bicycle for 7 days. The reason? A couple of cracked ribs. I've tried each and every day to cycle, but it hasn't been possible. 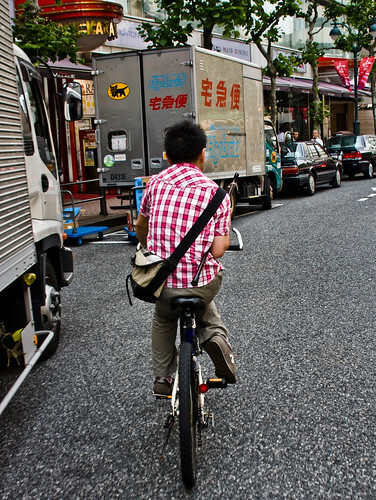 When a simple cough is enough to bring tears to your eyes, riding a bicycle is a long shot. A serious blow to my pride but hey, at least I can walk around the neighbourhood. Which is nice. 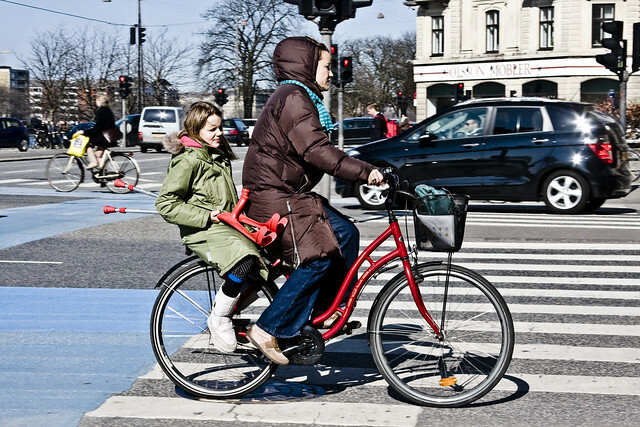 Many Danish cities have small cars like these to measure the level of comfort on the bicycle infrastructure. I have a better, cheaper idea. The city should just give citizens with broken or cracked ribs a smartphone, with activated GPS and a live line to a person at the Bicycle Office. Then they just ride around the city. Every time an OWWWW! or groan is heard, the GPS location is registered. That way the city will be able to map the spots that need maintenence. Now broken ribs are one thing, but what of citizens with more serious injuries or disabilities? 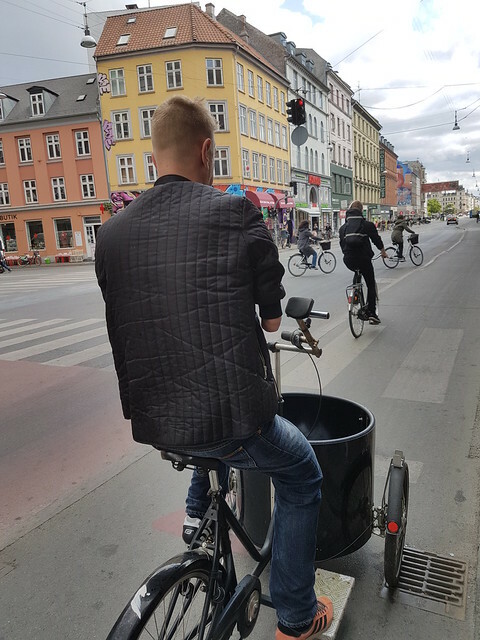 So I thought I'd whips together this article with photos of Copenhageners and other urban dwellers cycling with injuries or disabilities or using other vehicles that improve accessibility and mobility. 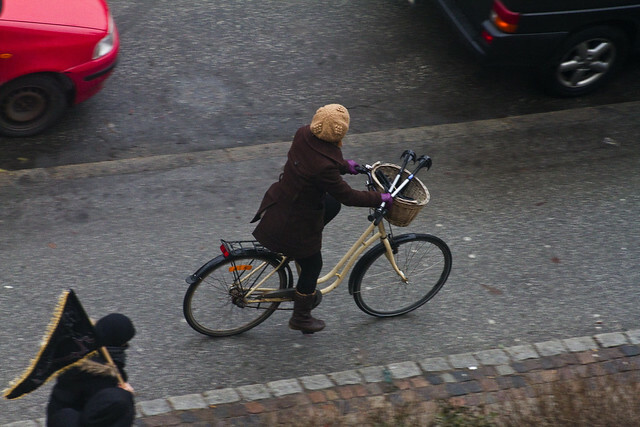 Like the shot of a Copenhagener in the morning rush hour (above) riding with what looks like a broken - or at least injured - hand, above. Still looking cool as you like. 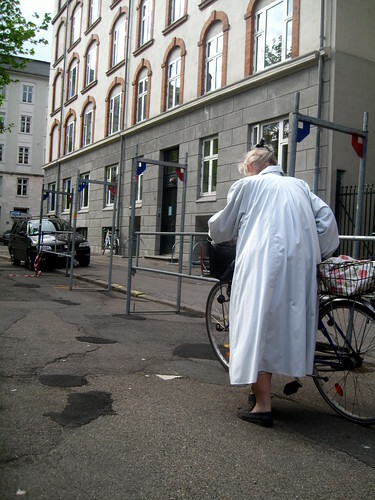 Then there is this Copenhagener carrying her crutches with her on her bicycle. Fair enough, she might have been heading to the hospital - across the street - to deliver the crutches back. Then I remembered this shot from a while back of a girl carrying her crutches and getting doubled by her mum. The bicycle is a versatile tool. I know several friends who, after many years playing sports, have problems with their knees. 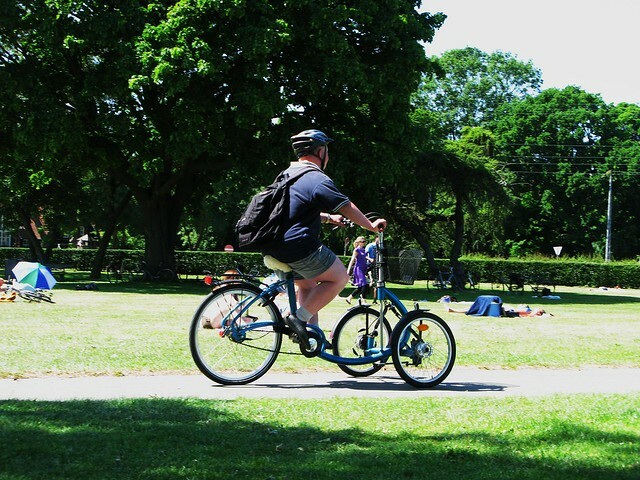 They are invariably advised to ride a bicycle by their doctors. There is a bike for almost everyone. 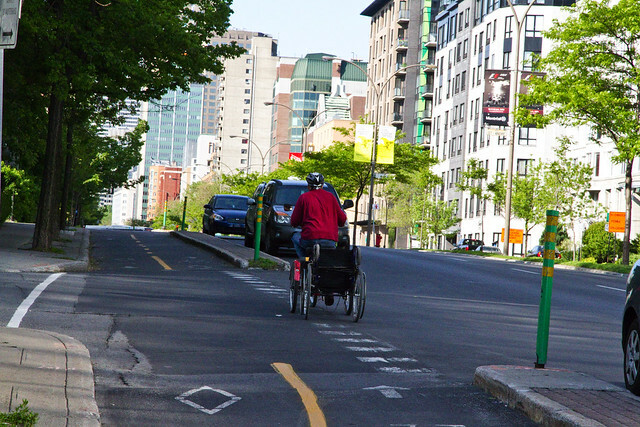 If you also make the bicycle the quickest and safest way to get around a city, people will do so - whatever their physical challenges. 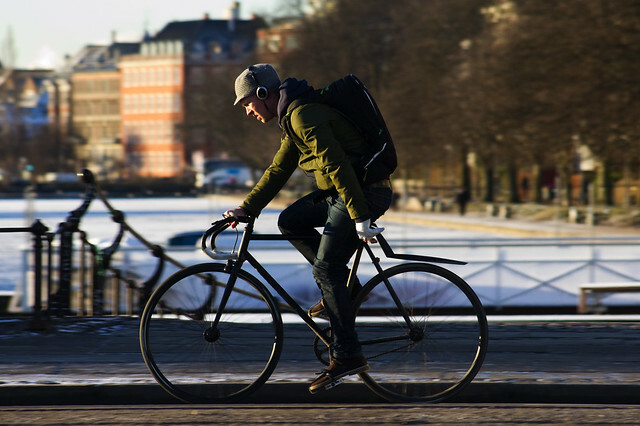 The bicycle is a freedom machine for many people. The dapper gentleman to the left may have reduced mobility for whatever reason, but he can get out and about with ease on this tricycle. Note his cane sticking out of the back. I see the man in the right photo quite often. He rides a tricycle and only has one arm. A friend of mine knows him and I'm told that he only has one leg, too. He lost his limbs in a landmine explosion in the country he was born. He still gets about with ease on his wheels. Both of these gentlemen were impeccably dressed. This gent is amazing and so is his cargo bike. 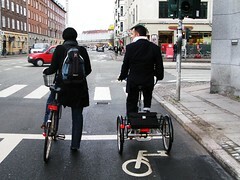 A retrofitted Nihola lets him ride around the city with no lower arms and only one leg to pedal with. Fantastic. If you're a legendary Danish rock star, like Steen Jørgensen (above), you have a certain look to maintain and Steen pulls it off to perfection. The fact that he has no left arm is of little consequence. I took this photo in Tokyo. The man had some form of disability with his legs. It required effort for him to get the pedals to turn but you can bet that it was a fraction of the effort he'd use when walking. The lady on the left has a kind of cast on her leg, but still rides. The two photos on the right are from last winter. The boyfriend was holding the girls' crutches and she moved slowly along - injured foot wrapped in plastic - on a child's bicycle they had borrowed. 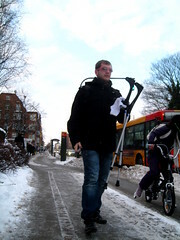 It was icy so the crutches were probably more dangerous than helpful so the bicycle stepped in to assist. They were heading to the hospital down the road. I spotted this lady in Vienna, Austria. Carrying her walking sticks to help her after she got off her bicycle. This quaint sign on this tricycle reads, "Slightly Disabled". What with all the bicycle options for disabled - whether permanently or temporarily - it's not surprising to see a parking sign like this outside my local library. It reads "Invalid Bicycles", reserving a space close to the door for those who need it. I took this photo in Montreal. 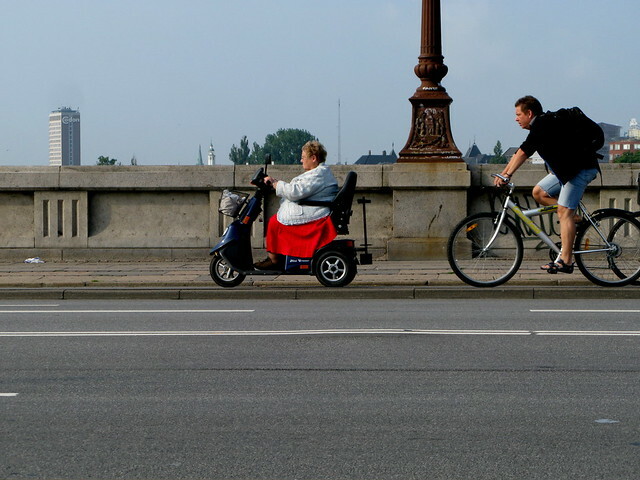 A trike pulling a wheelchair behind. This takes intermodality to a whole new level. 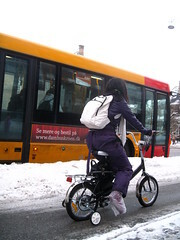 This retrofitted Nihola (it really is the Danish brand that offers unique variations of their cargo bikes) is designed simply to carry a wheelchair with passenger. 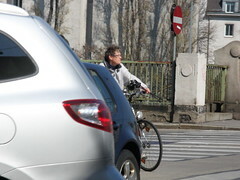 This gent has his walker in the front of his cargo bike - intermodality once again. 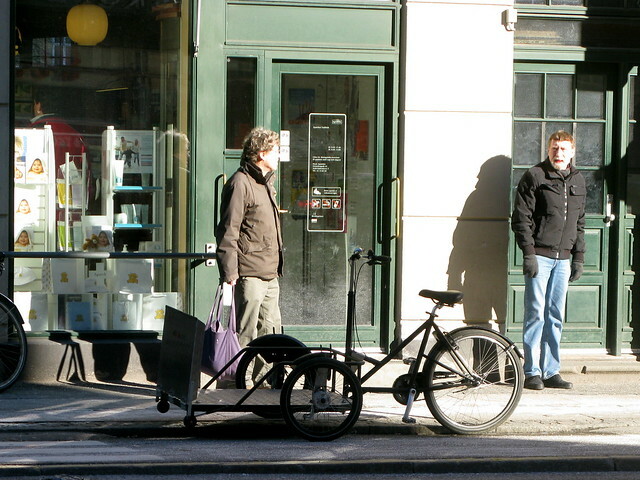 You see many trike brands in operation in Copenhagen on a daily basis. 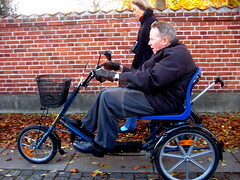 This gent had what appeared to be Down Syndrome and he enjoys active mobility on this trike. Spotted in Amsterdam. An electric scooter with the wheelchair on a rack on the back. 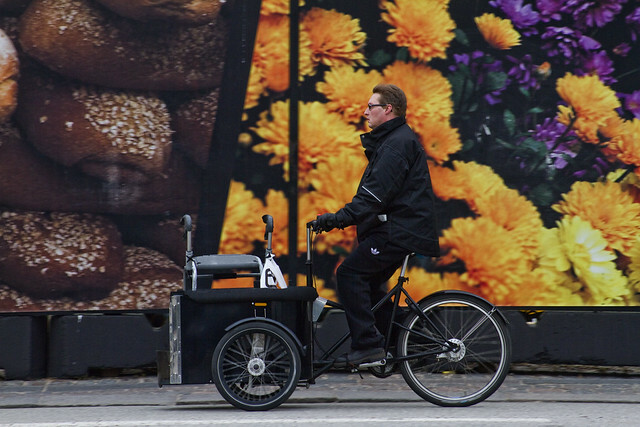 Compared to other cities, you see so many of such vehicles on the cycle tracks of Amsterdam and Copenhagen. Used by people with disabilities and the elderly. It's a massive market with many brands. 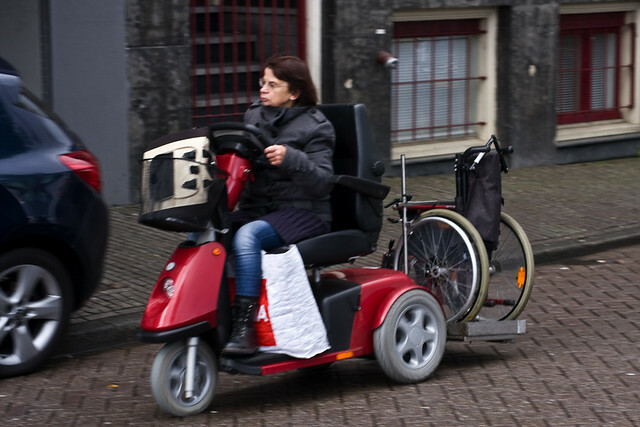 Offering urban mobility to people who might be restricted to a wheelchair. 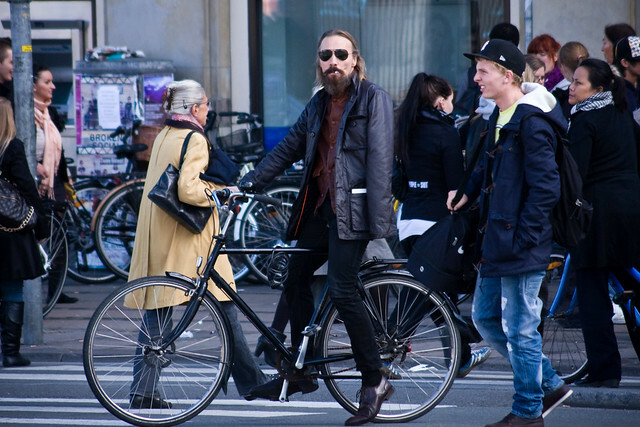 Cool as you like in Copenhagen. 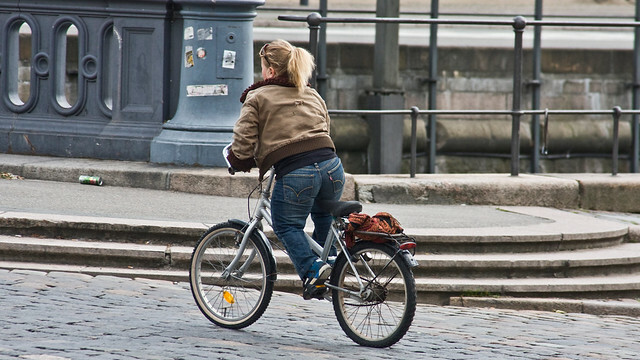 If it is ripe old age that has reduced mobility, the bicycle still serves a purpose. I see this lady all the time in my neigbourhood. Always walking her bicycle with groceries in the basket. 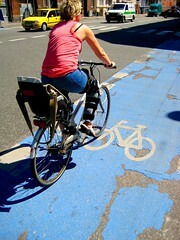 Perhaps too unstable to ride, but using the bicycle as a kind of crutch. Lovely.